With File Watcher, files are only processed when they have finished being written to disk - so huge video files (100MB - 10GB or more) will not be processed prematurely. See the extensive help file for many more examples. Fully recovers from network location downtime. To send an email from File Watcher, you need to use a command-line email program. We STRONGLY recommend you do NOT search for a free download of sendmail.exe - these are 99% guaranteed to contain a virus. Instead, please download from our partner at Absolute Tools. To run File Watcher on reboot, just copy the FileWatcher shortcut to the Programs\Start Up folder, and customize the start-up parameters. To run FileWatcher as a service and keep it running even after system restarts or possible server crashes, we recommend FireDaemon. 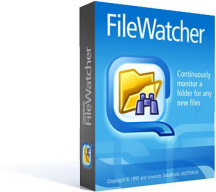 As we change web files, FileWatcher detects them, bundles them into a file list every 5 minutes and uploads them. File types: *. * - we can also use TextPipe later to strip out file types we don't want like _vti_cnf files. We use TextPipe (Lite, Standard or Pro) to massage the filename into a form suitable for Windows' FTP client (prepare_ftp.fll).